Does your child have trouble chewing his food or crave tactile input to his mouth or jaw? Chewy Tubes are helpful tools for practicing chewing, biting, and oral motor skills. They are designed to provide a valuable sensory input, and provide a safe, latex free chewing option for your child. 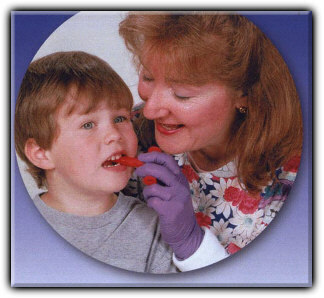 They are especially helpful tools for those who demonstrate teeth grinding and mouthing of non-food objects. Children as young as 10 months old may enjoy the tactile input provided by Chewy Tubes. Intended for individual use, Chewy Tubes are non-toxic, non-flavored, lead free, and they do not contain PVC or phthalates. Chewy Tube colors are FDA approved. Green Chewy Tubes® offer a knobby surface for additional sensory input. How do you use a Chewy Tube? Insert the stem laterally into your child's mouth near the molars and encourage biting. Each Chewy Tube has a grooved handle so that the tube will not go too far back into the child's mouth. Be careful! Chewy Tubes should only be used under adult supervision. They are not for continuous chewing or repetitive biting.